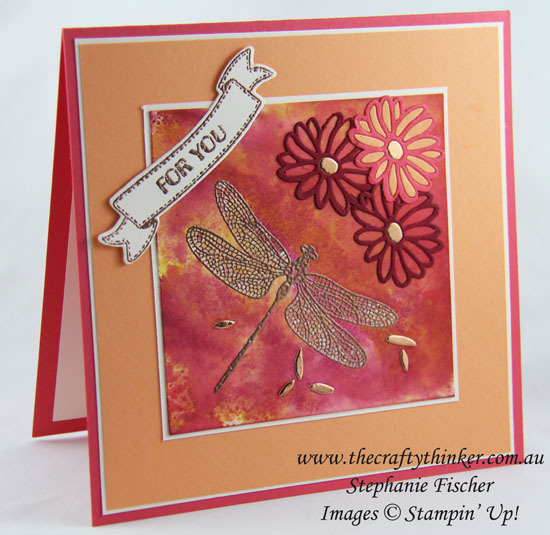 It's Friday which means .... Crazy Crafters' Projects Highlights day! To see all the amazing entries and vote for your favourites, click here. I made a few inky backgrounds the other day (I like to do messy things like that in batches!) and used one of them for this card. Copper makes everything "special" as well as warm and inviting! 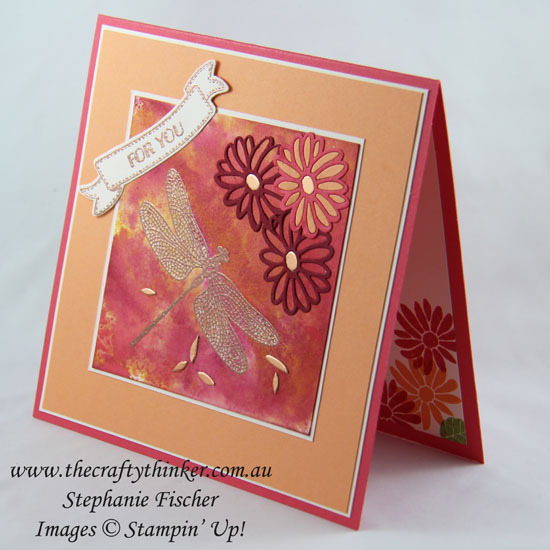 Having cut my piece of Shimmery White cardstock to the size I wanted, the first thing I did was to Copper heat emboss the dragonfly image. Then, to make the background I used Peekaboo Peach and Watermelon Wonder ink pads, a water spritzer, plastic bag and waterproof craft mat. I basically used the plastic bag smooshing method of applying ink to wet cardstock (wet the cardstock, pat the ink pad down on the plastic bag to transfer ink, smoosh inky bag onto wet cardstock) but, not quite happy with my result, I also patted some ink down onto the craft mat, spritzed it with some water and tapped the cardstock into it. Once it was all dry, I layered up the cardstock and added the remaining elements. I cut flowers with the Stylish Stems small flower framelits - one in Watermelon Wonder and two in Cherry Cobbler. Having adhered them into place, I cut just the petals in Peekaboo Peach cardstock and glued them into position in the Watermelon Wonder flower. I then partially cut three more flowers with Copper Sheet. The centres were adhered into the three flowers and I sprinkled some of the petals around the dragonfly. I'm so proud of myself for achieving "random"!! I copper heat embossed the banner and sentiment before cutting out the banner with the matching die from the Bunch of Banners framelits. To finish the inside of the card, I stamped flowers from the Special Reason set in one corner using Peekaboo Peach, Watermelon Wonder and Wild Wasabi inks. Thank you for visiting - don't forget to visit the highlights!